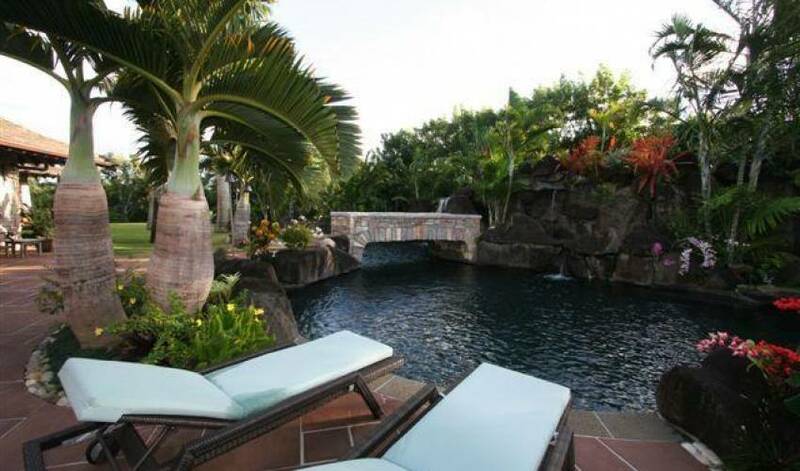 Imagine whiling away your dream Hawaiian vacation at this expansive Anini luxury home. 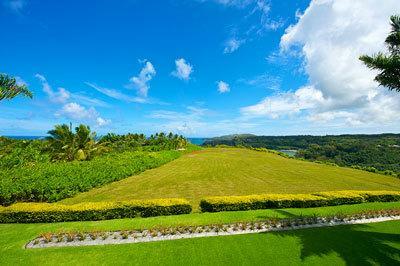 This spacious Kauai rental home and its sprawling acreage will give you and your guests premier ocean views of the deep blue seas surrounding the Garden Isle. 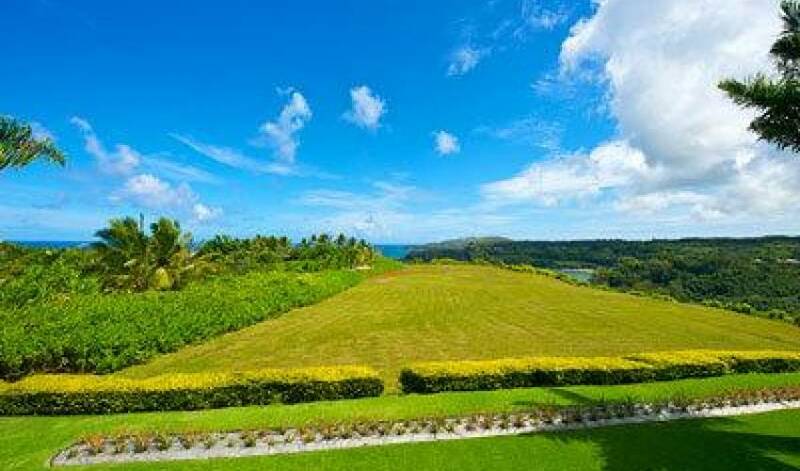 Once you enter the grounds you’ll feel like you’re in a world of your own, but in reality you’ll only be minutes from the neighboring resort town of Princeville with its world-class golf, shopping and restaurants. 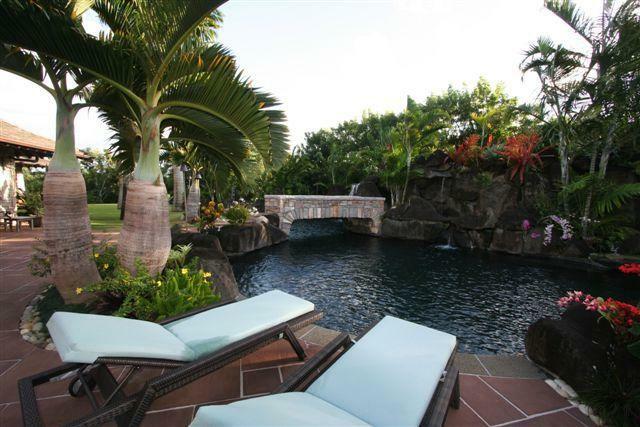 The five spacious and airy bedrooms plus the dual-purpose office can easily accommodate up to 12 people who will cherish their time at this elegant Anini rental home. 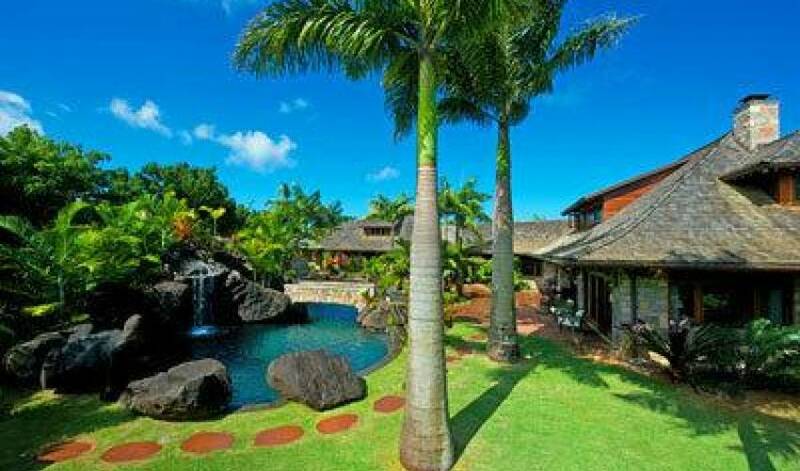 This Kauai luxury rental boasts an extraordinary 7,000 square feet including a huge covered lanai. The architecture is classic island design with open floor plans, hardwood floors, ample glass and natural light, high wood beam ceilings, ceiling fans, and strategic use of stone throughout. You will not be disappointed especially with views of the ocean in the distance. 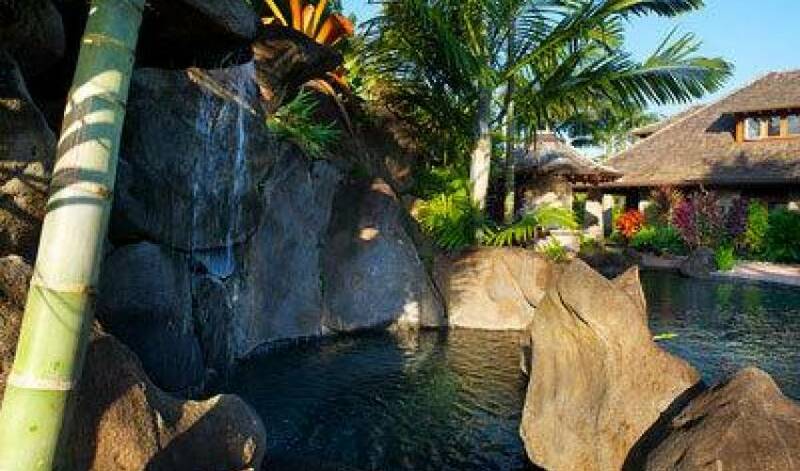 There is a 90,000 gallon salt water, lagoon-style pool and spa, complete with two waterfalls and grotto. 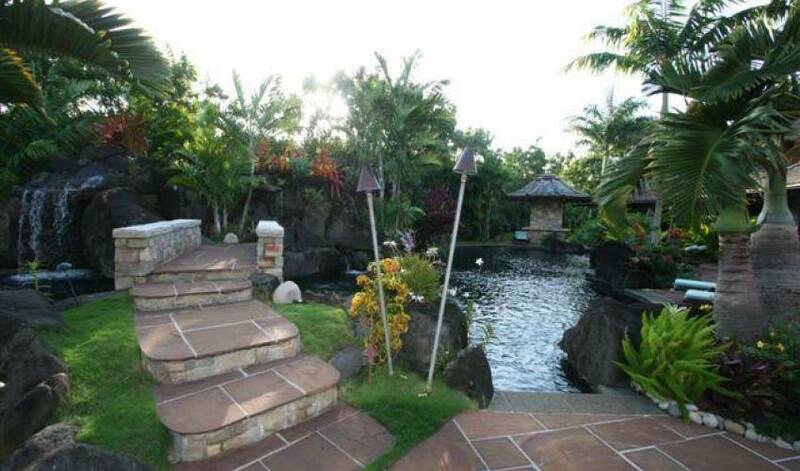 How big is this pool? A massive 84 feet long! For the chef in your entourage, Enchanting Meadow has a dream kitchen that is ready for feeding crowds. Three dishwashers, two sub-zero 42” refrigerators, a 60” range, 30” gas cook top, two microwaves, two under counter refrigerators, ice maker, two custom copper farm front sinks, a copper prep sink, and granite counters. 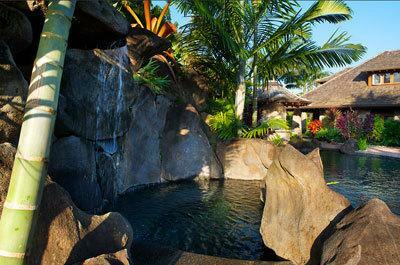 There’s also plenty of opportunity to dine al fresco; there’s an outdoor grill in the stone cabana and gas tiki torches to light at night. 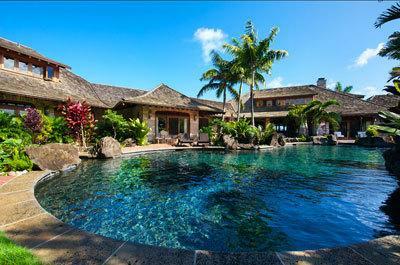 This Anini luxury home makes excellent use of the huge floor plan under roof. The Villa has a showcase dining room, living room, giant masonry fireplace, sitting room, family room, theatre room with copper sink for fixing snacks, and two laundries. Placed throughout the living areas are five home theaters with 24” HD TV’s. The home is composed of a main house and a guest house. 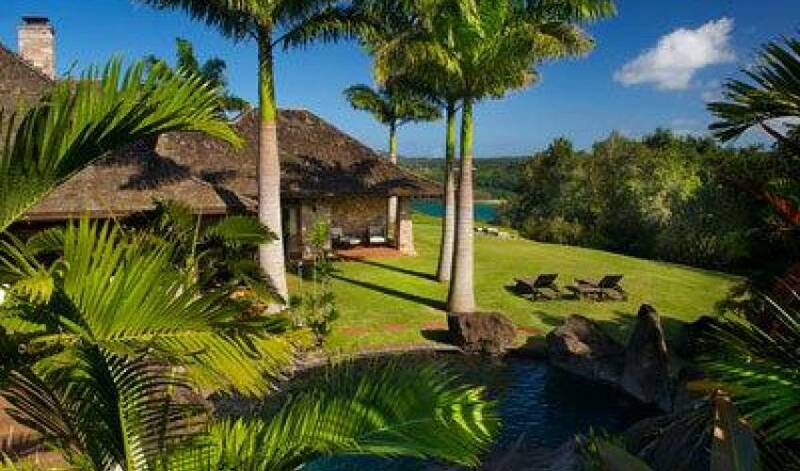 The main house features two King suites with gorgeous ocean views. Each offers a King pillow-top bed and luscious Master Bathroom with a copper slipper tub. The other two suites offer a Queen pillow-top bed and share a beautiful baths with slipper tub. The office can be used for work (if you absolutely must!) or sleep – there is a Queen bed in the office which serves as the 5th bedroom in the main house. 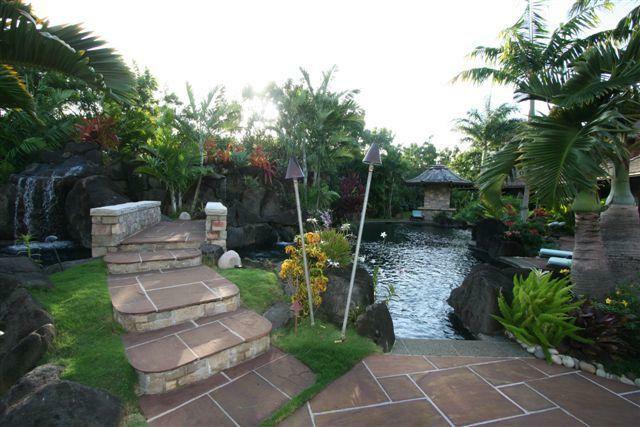 An additional 7 guests can be accommodated in the guest cottage or ohana. 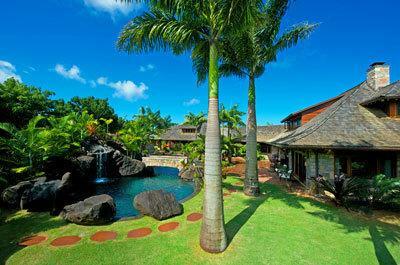 The ohana offers a living room, media room and one King bedroom suite. 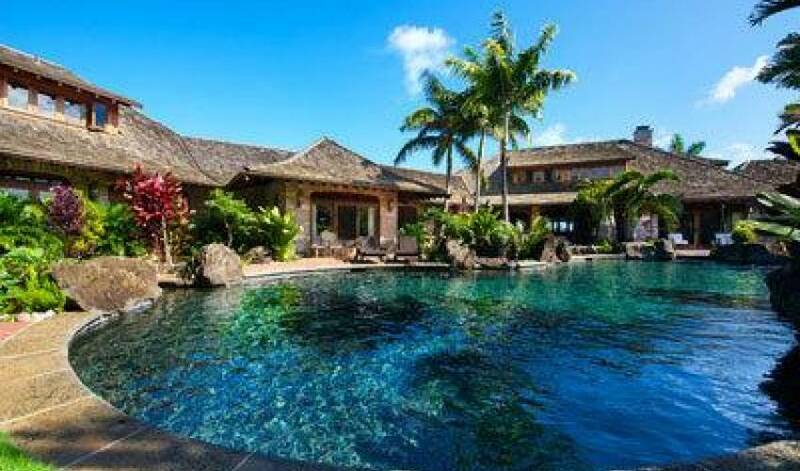 The villa comes with four Frontgate airbeds with frames – 1 Queen and 3 Twins. These can be arranged in the media room or throughout the ohana. 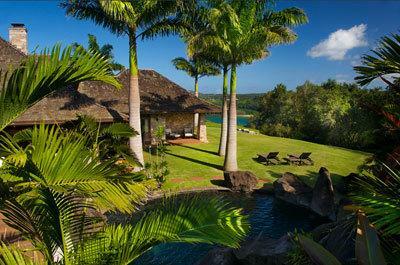 Enchanting Meadow can easily be the ideal Kauai vacation rental home to 17 guests!